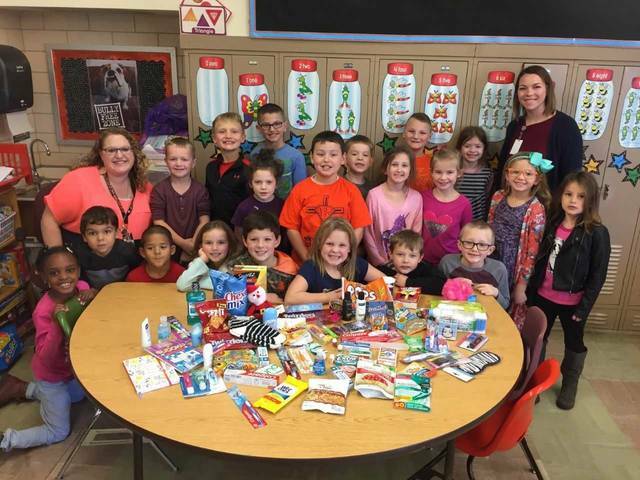 Elida Elementary students in Mrs. Hanefield’s first grade class and Mrs. Reese’s third grade class collected items to send five Christmas care packages to five soldiers. Submitted. ELIDA — Students at Elida Elementary School collected items to send Christmas cheer to soldiers. The students collected enough items to send five care packages to five soldiers. Classes participating in the collection drive included students in Mrs. Hanefield’s first grade class, as well as students in Mrs. Reese’s third grade class. https://www.limaohio.com/wp-content/uploads/sites/54/2017/12/web1_Elida-Elementary-Care-Package.jpgElida Elementary students in Mrs. Hanefield’s first grade class and Mrs. Reese’s third grade class collected items to send five Christmas care packages to five soldiers. Submitted.